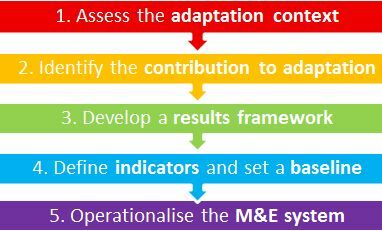 This guidebook describes five steps (see illustration below) to design adaptation projects and their results-based monitoring systems. It offers practical advice to the questions “What characterises an adaptation project?” and “How can adaptation results be measured?”. The five steps are illustrated through a case study from India. The guidebook is accompanied by an Excel Tool to operationalise the five steps (►MACC Tool). Adaptation Made to Measure. 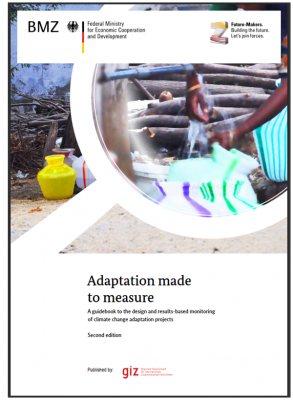 A guidebook to the design and results-based monitoring of climate change adaptation projects. Second edition. (1.4 MB) This guidebook presents a five-step approach to designing adaptation projects and results-based monitoring systems. This new edition of the guidebook was fully updated in November 2013. It is accompanied by an excel tool and a repository of adaptation indicators. Adaptación a medida. Manual para la concepción y el seguimiento basado. Segunda edición (1.8 MB) Spanish translation of Adaptation made to measure (Second edition). 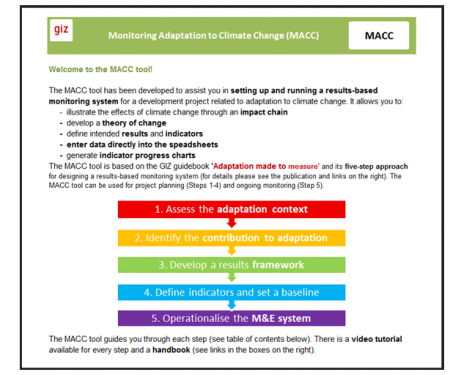 The excel tool “MACC” leads project managers through the five steps of the guidebook ►“Adaptation made to measure”. It can be used to directly enter monitoring data and keep an overview of project progress. Based on a theory of change approach the tool allows defining up to 15 intended results with up to three indictors each. Data can be directly entered into the excel file making it a very practical devise for project monitoring. The tool is easy to navigate and video tutorials explain each of the five steps. It is also helpful for planning adaptation projects. Excel-Tool to plan and monitor adaptation Projects based on the Guidebook “Adaptation made to measure”. Handbook explaining the use of the MACC Tool. coastal protection project in Viet Nam. The methodology is described in detail in the publication and illustrated by comparing two adaptation options in Viet Nam: building a dyke or planting mangroves. An excel tool is provided for calculation of Saved Health and Saved Wealth. 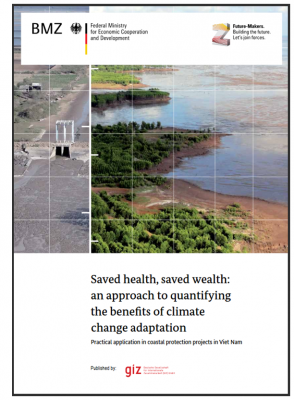 A special feature of the Saved Health / Saved Wealth approach is that it can also be used to estimate adaptation benefits before a project starts based on scenarios of climate change impacts. See also the two accompanying Excel Tools below which illustrate the calculation for a dyke and a mangrove case. Excel tool accompanying the study “Quantifying adaptation benefits and comparing coastal protection adaptation projects in Viet Nam” focusing on the dyke example. Excel tool accompanying the study “Quantifying adaptation benefits and comparing coastal protection adaptation projects in Viet Nam” focusing on the mangrove example. This guidebook seeks to support project managers in providing an overview of different impact evaluation methods and how they can be applied to climate change adaptation projects. It provides practitioners with guidance to select the appropriate approach for a particular climate change adaptation project, based on its characteristics and the available resources. The application of the guidebook is further illustrated with a case study of an adaptation project in Bangladesh. 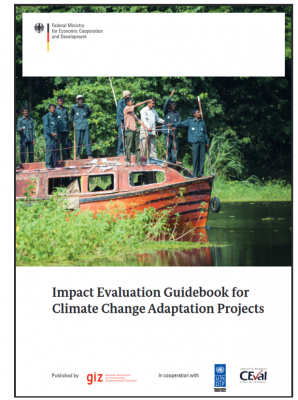 Thus guidebook provides an overview of methodologies for Impact Evaluations and how they can be applied to climate change adaptation Projects.